Even as a teenager, it was clear that Kobe Bryant was special. Although injuries and age finally took their toll, he put forth elite play in multiple decades and remains one of the biggest figures in modern basketball. 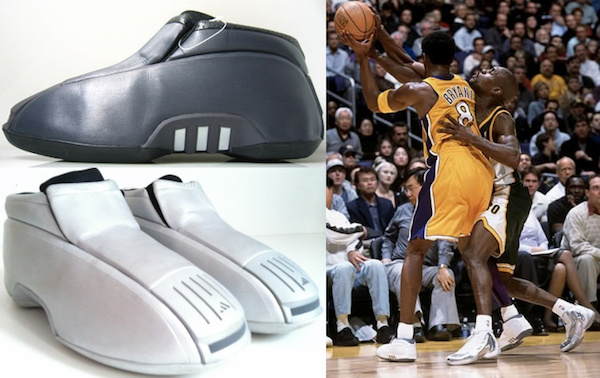 It should come as no surprise that Kobe Bryant shoes are in the same discussion as LeBron James shoes and behind only Michael Jordan shoes as far as the top signature sneaker lines in basketball history. There are also some pretty sweet Kobe Bryant basketball cards. 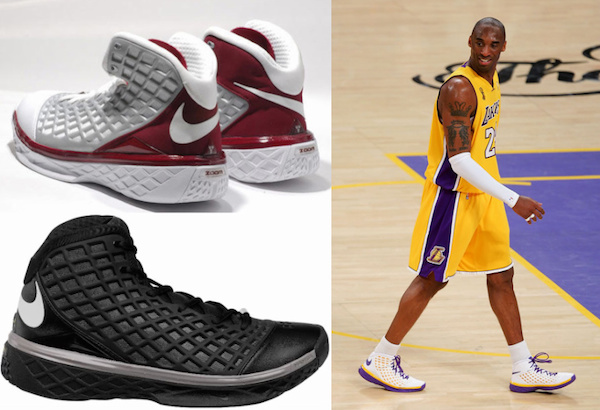 The key difference between the shoe lines for Michael Jordan, LeBron James and Kobe Bryant is that Kobe was not always a member of the Nike brand. 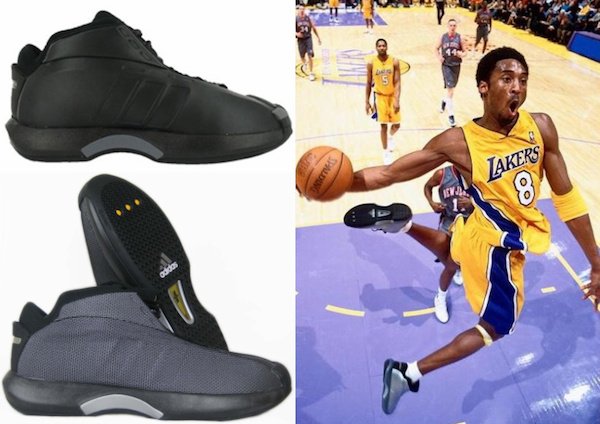 Only 17 at the time and fresh out of high school, Kobe Bryant signed an endorsement deal with Adidas. The six-year deal was reportedly for $48 million. This might explain why he did not sign with Nike to start his career as Adidas made a huge offer to Bryant even before he was drafted. A month later, Bryant was taken 13th overall by the Charlotte Hornets and then traded to the Los Angeles Lakers. After a low-key rookie season coming off the bench, Kobe Bryant would take his game to the next level and become one of the best players in the NBA by the 2000-01 season. 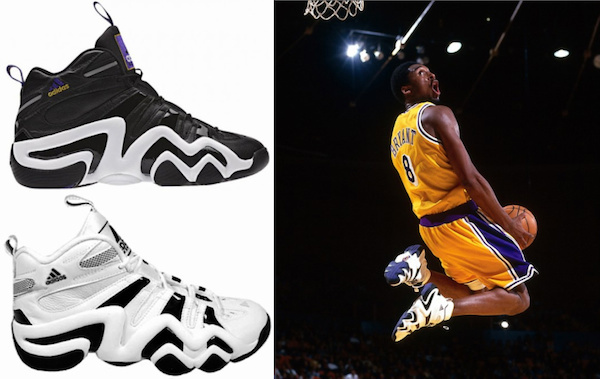 His Adidas shoes were along for the ride and, other than their association with Bryant, are most memorable for their crazy designs. 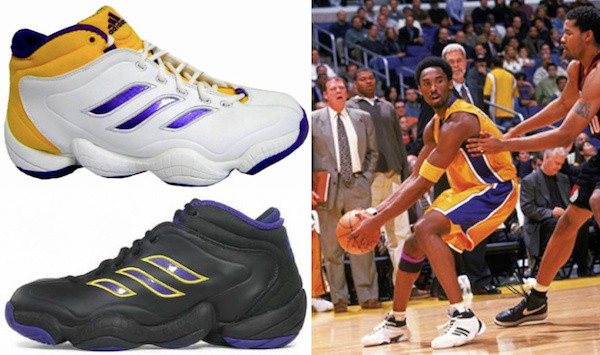 This might have ultimately been the undoing of the Adidas endorsement deal with Kobe Bryant. Reportedly unhappy with the KOBE TWO, Bryant officially made the switch to Nike in 2003 following the end of his contract with Adidas during the summer of 2002. 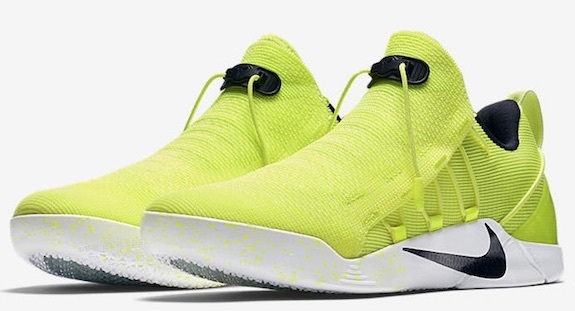 This did not prevent work on his next Adidas shoe, and images have surfaced for what would have been the follow-up to the KOBE TWO, although no official name was provided. This was not the only time that Kobe Bryant switched to a competitor in the collecting world. Many will remember that before he was the face of Panini Basketball, Kobe Bryant was part of the Upper Deck family. 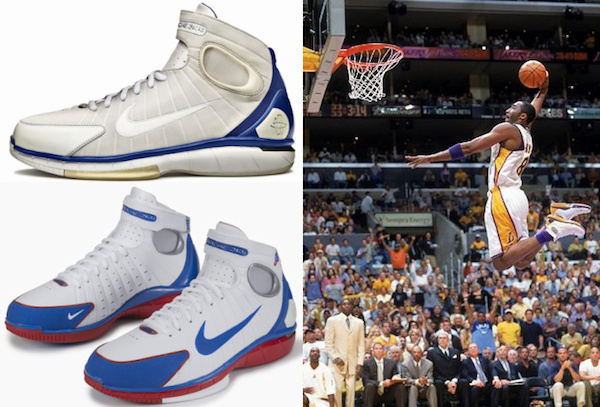 The Nike era of Kobe Bryant shoes began slowly as they collaborated on the inaugural signature design. 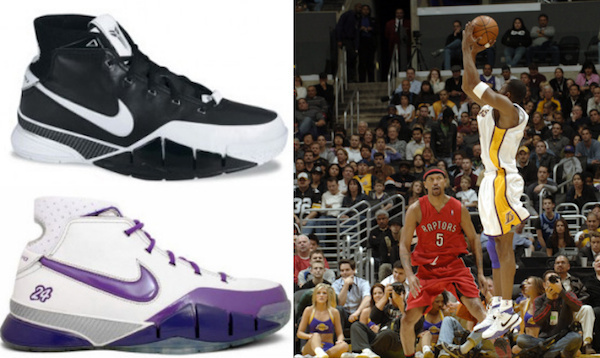 In the meantime, Kobe took the court mostly wearing Nike Air Huarache sneakers for the 2003-04 and 2004-05 seasons. Finally, the Nike Zoom Kobe I made its debut and Bryant's line has been one of the most popular signature shoe offerings since then. 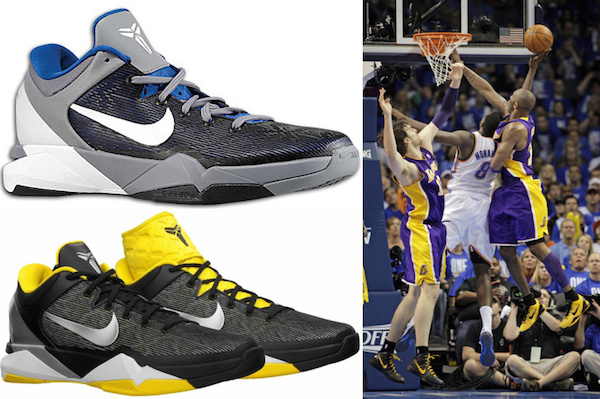 Kobe Bryant shoes have gone through a considerable transformation while with Nike. 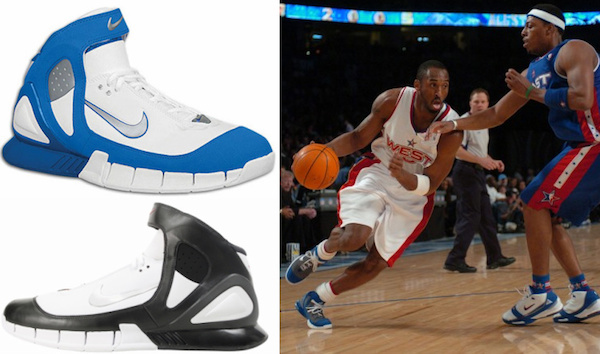 The first edition was more of a standard basketball sneaker and subsequent editions transitioned to a low-top look, following a soccer-shoe design. 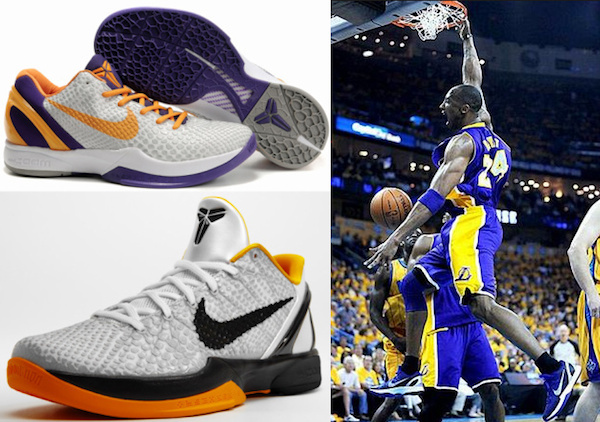 In addition to the many Kobe Bryant shoes in his base signature offerings, multiple variations, including Elite and Prelude, add to the totals. 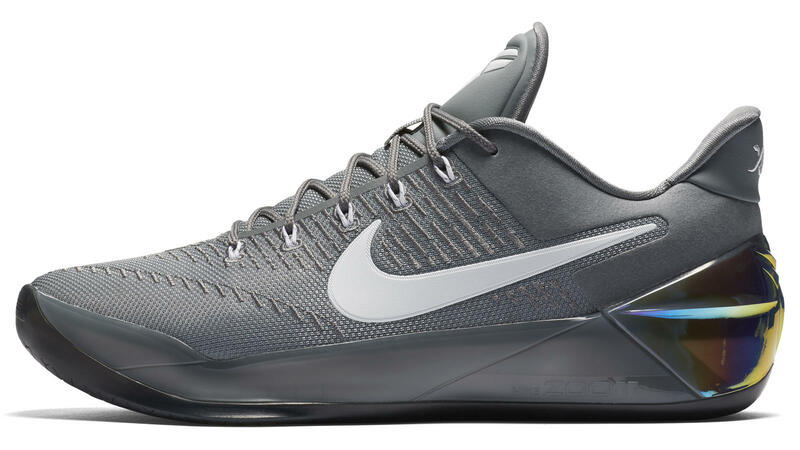 The Nike Venomenon was previously not available in the US, but sneakerheads stateside can now find the lower-priced Kobe Bryant shoes. 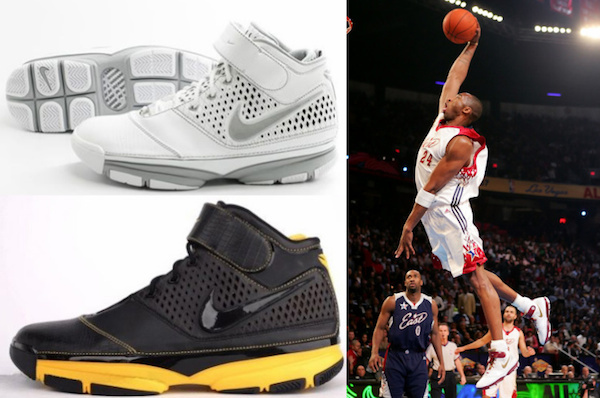 Also, the original Nike HyperDunk (2008), is commonly associated with Kobe Bryant. The Nike Kobe A.D. (a.k.a. Nike Kobe 12) is the first release for the line following Bryant's retirement. 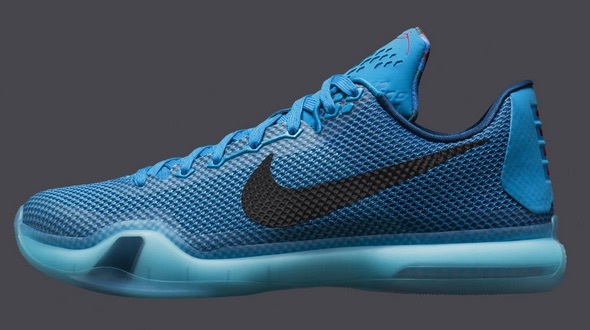 The name appears to end the shoe numbering system (for now) but many will still likely refer to it as the Kobe 12. 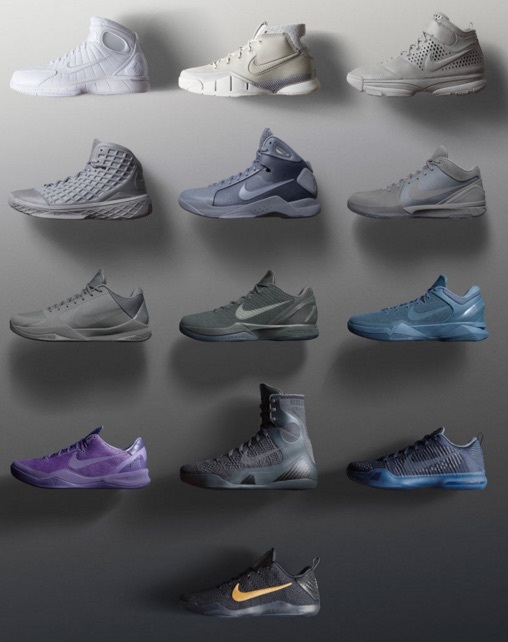 There is also a limited Black Mamba Pack that revisits all 13 Nike pairs worn during his career up until his final NBA season. 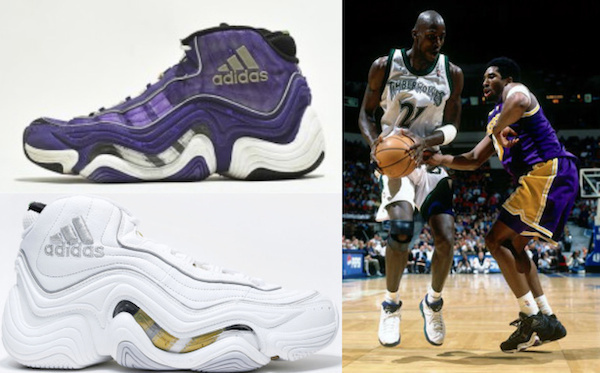 The line was released over several weeks in the order he wore them, leading up to the day of his final NBA game. 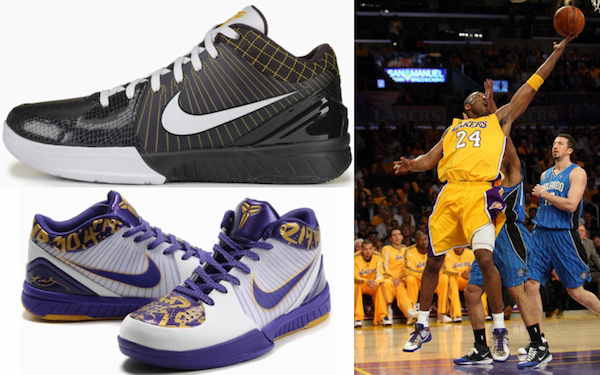 Shop for Black Mamba Pack sneakers on eBay. 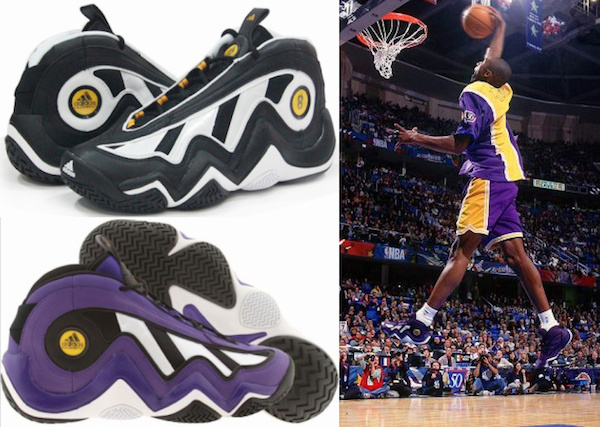 The following guide includes a chronological listing of all the main Kobe Bryant shoes. Each shoe is listed by name and the main season it was featured. 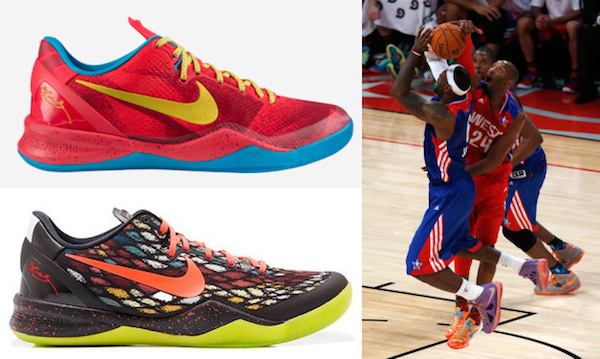 *Shoes synonymous with Kobe Bryant, but not officially among his signature shoes. Click on the individual sneaker listings below to shop for shoes on eBay. The various Adidas and Nike shoes are separated by brand with tabs. 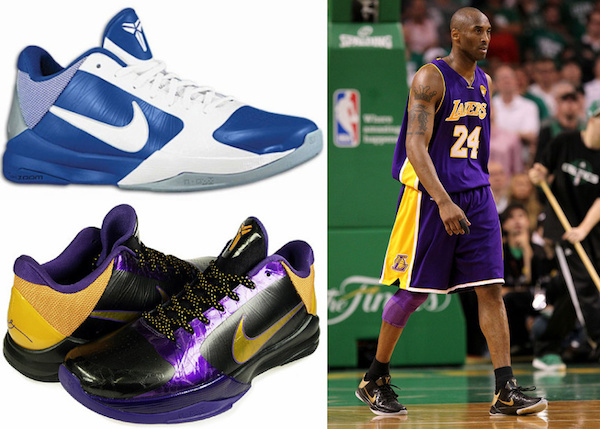 Nike Zoom Kobe 1 Protro "Final Seconds"
Nike Air Zoom. 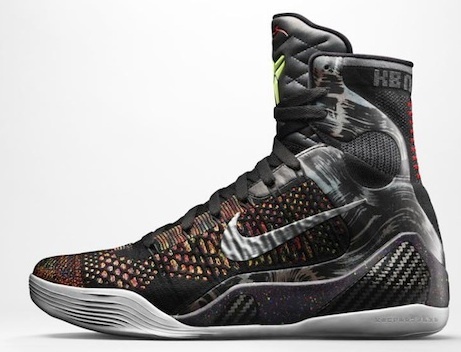 Kobe 1. Uptempo. Protro. 81 Points. NIB. US: 11. Nike Kobe AD NXT 360 Mamba Day Size 12.5. Black Red Green. AQ1087-001. Nike Kobe AD NXT 360 Mamba Day Size 11.5. Black Red Green. AQ1087-001. Nike Kobe AD NXT 360 Mamba Day Size 13. Black Red Green. AQ1087-001. Nike Kobe AD NXT 360 Mamba Day Size 14. Black Red Green. AQ1087-001.